John Skelton was born in Co. Armagh, Northern Ireland in 1925. He was educated at Queens University, Belfast, Belfast College of Art and St. Martins School of Art , London. He started his professional career in London, where he came under influence of Euston Road School in the late 1940s. In 1946 he married Caroline, settling four years later in Dublin. He worked initially in advertising as Art Director and illustrator of books, most of them educational. After 1975 he worked full-time as a painter. He had 25 one man shows in Dublin; two in Belfast, one in Los Angeles and one in the Mystic Seaport Museum in Connecticut. Up to the late 1980s, John was frequent exhibitor in group shows, particularly the annual Royal Hibernian Academy shows in Dublin. In recent years, however, his work was in such demand that he contributed to these less often. During the 1970s and earlier 1980s he earned a reputation as a gifted teacher and lecturer in the National College of Art and Design in Dublin. 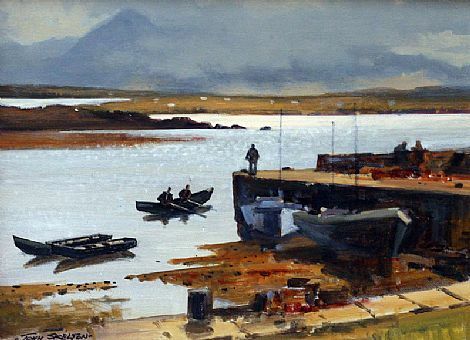 The artist lived in Dublin with his wife, Caroline, and they had three sons, Paul, John Francis (also a painter) and Michael.